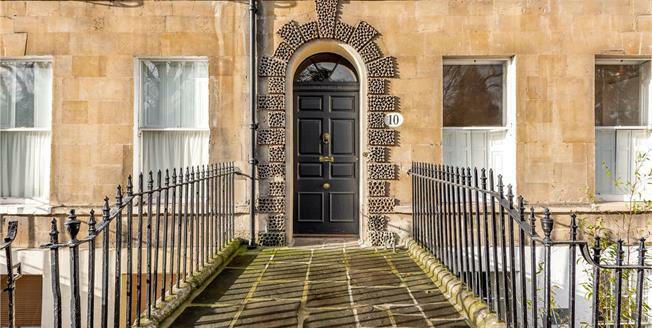 A superb opportunity to acquire this one bedroom ground floor apartment located in a Georgian terrace, just off the world famous Great Pulteney Street and opposite Sydney Gardens. These gardens were established in the 1790s and are now the only remaining eighteenth century pleasure gardens in the country; a much favoured spot for Jane Austin. The property is a lovely home or investment opportunity now offered with no onward chain. The property forms part of a Grade I Listed terrace of buildings designed by Thomas Baldwin circa 1795. Benefiting from having a private entrance; No. 10 welcomes you with a graceful, period reception hall, following elegantly through to the rest of the apartment with grand proportioned rooms. The light and airy sitting room is located towards the rear of the property, once again benefitting from the grand proportions and overlooking the rear communal outside area. With period features such as cornicing, ceiling rose, tall sash window and a central feature fireplace. The kitchen/dining room is of particular note; after recent refurbishment it now offers ample fitted units with a granite worktop and integral appliances including a double oven, gas hob and a dishwasher. There is also adequate space for a dining table. The master bedroom is a light spacious room enhanced by the high ceilings and the tall sash windows allowing natural light to fill the room. This wonderful space also benefits from many period features and built-in wardrobes. A further advantage is a fantastic mezzanine storage facility above the luxury fitted shower room which is tastefully finished with tiling from floor to ceiling and fitted with a rain maker shower. The private back door of the property leads out onto a west facing courtyard that follows onto the secure gated parking. Sydney Place is a handsome Georgian terrace situated opposite The Holburne Museum and close to the world famous Bath Spa Hotel. Local amenities can be found on nearby Bathwick Hill and the city centre is a level walk via Great Pulteney Street. The city of Bath itself offers an array of cultural and leisure amenities and is interspersed with parks and public areas. Bath has excellent communications with the city of Bristol and is approximately 10 miles from Junction 18 of the M4 in the north. There is a high-speed train service from Bath Spa Station to London Paddington (approximately 90 minutes) and to the west. Term of Lease: 935 years from 25.03.1982. Service Charge: £1692pa. Ground Rent: £100pa.